I've always been a Superman fan, and the Kryptonian hero has always been my favorite superhero. 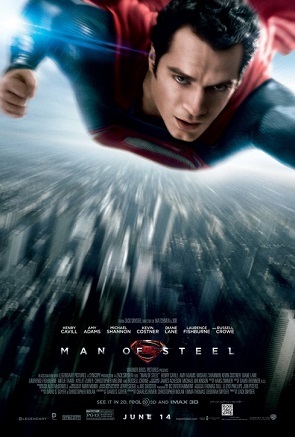 Yet I was cautiously optimistic when Man of Steel was released earlier this year, since I was totally disappointed after watching Superman Returns in 2006. I had high hopes for that movie, only to have them seriously crushed, so I wasn't sure what to expect of MOS, and was not even sure if I was going to watch it. Then I read some spoilers about Lois Lane actually acting and behaving like a reporter, for like the first time ever, and that fact alone, got me to the theater in record time, LOL. Since then, I saw the movie like 8 times in the theater, and completely fell in love with Amy Adams' Lois and Henry Cavill's Man of Steel. So the rest as they say... is history! Bottom line... I LOVED this movie, and can't wait for the DVD to come out next month. It was an entirely new take on the legendary superhero, and I for one really liked the angle that Snyder et al took to portray Clark Kent as someone who *never* really fit in. It totally made sense to me, to see Clark/Kal-El as the would-be hero of the world; who had a rough ride before he could fully live up to his true potential, and embrace his destiny as earth's savior. As for Lois, she is definitely one of my favorite female characters of all time. I was annoyed over and over again, when in previous incarnations of L&C that the so-called Pulitzer prize winning reporter couldn't put two and two together where Clark and Superman were concerned. So to have Lois make the connection from the get-go, was a refreshing change of pace for me. L&C rock, and this movie made it even more obvious why these two are the super couple of all time! I also loved how while Clark/Kal is earth's savior, Lois was portrayed as his own personal savior. The religious symbolism that was all over the movie was just awesome too. Not being of the Christian/Catholic faith, my knowledge of the Bible is embryonic at best. So I felt like I had a crash course after watching the film, which I loved, since I always appreciate the chance to learn something new. I also appreciate all the stimulating discussions with Eowyn77 and Babette that gave me a better understanding of the Biblical themes that were explored in the movie. Thanks, ladies! Anyhow... there was so much that I loved about MOS, that I can't seem to stop gushing, LOL. But I will stop here for now, and let someone else take a whack at it. So... what did you think? Share your thoughts in this thread! I think anyone who reads New Beginnings can get a pretty good idea of what I thought, but for those who haven't, I'll elaborate. It was awesome. I hadn't seen any Superman-related things before, and I was totally hooked. I'm a sucker for superhero things and I just loved these characters and their interactions with each other. I also loved the whole conflict posed by Clark's dual-nationality (for lack of a better word): he's not from Earth, and yet, he's lived all his life on Earth. So will he destroy the only members of his race left, or let them take over the world he calls home? It's a real conflict, the kind you don't see in a lot of movies anymore. The whole things seemed pretty human for a superhero movie; the real conflicts didn't have anything to do with Clark's super-human abilities, in a sense, but more with issues of identity, belief, tolerance, and mostly, loyalty. There were also so many in depth character relations...not to mention Henry Cavill is sickeningly attractive. And Lois Lane...she's just awesome. And having since seen several other Loises, I think Amy Adams was one of the better ones. Long story short, it was great. I could probably go on for a lot longer, but it's late, and I should probably leave room for other people to share their opinions too. Hooray, you added Man of Steel! I'm dying for the movie to come out on DVD to kick-start my muse again on Interludes, but I thoroughly enjoyed our conversations about the symbolism of the movie, Shaliza. A well-played archetype is one of the fastest ways to my heart, and Snyder et. al. did a beautiful job with everything from the "baptism by fire" (in the oil rig scene) to the powerful Mary Magdalene archetype for Lois Lane. I left the theater literally stunned. I think Man of Steel brought Superman into the 21st Century and turned a superhero who was, frankly, getting a little stale into someone who can appeal to our modern sensibilities a bit more without losing the fundamental charm that is Superman. One question to toss out just for discussion sake: does anybody know (or have any theories) about why the Codex was originally a skull? I can't help but think that Jor-El's idea to make Kal a literal everyman wasn't an original one. Was someone else a "perfect" Kryptonian 400 years previously? Musicwritesmylife and Eowyn, great posts, ladies! Now about the Codex, I was more than a little confused when I first watched the movie. Then after repeated viewings I realized that fusing the DNA within it, with Kal's cells, was Jor-El's vision for the future with a human/Kryptonian hybrid race. I mean Jor-El pretty much gave Kal his blessing to pursue Lois in that scene on Zod's ship. I really loved this concept, and am really glad that the writers went with this unique route of story-telling. As for why the Codex was in the shape of a humanoid skull, hmm… I just assumed that it was a visual metaphor for the race and the new age, genesis chambers and the like. I could be wrong though, and Eowyn, I really like your idea that perhaps it is reminiscent of the *perfect* Kryptonian that existed eons ago. That's a fascinating concept, for sure.